Sweet Alibi play St. James Community Hall Nov. 12. Jen Squires photo. 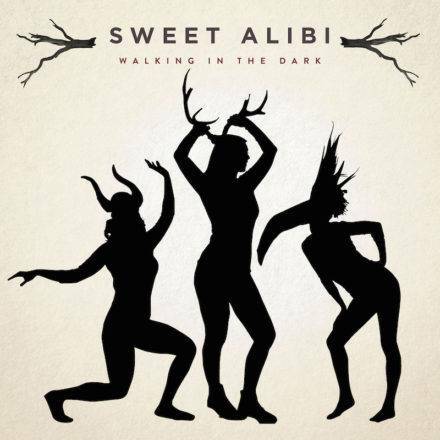 Winnipeg’s Sweet Alibi released their album Walking in the Dark this time last year. The folk-pop trio is currently on a co-headlining tour with Nashville-by-way-of-Toronto singer/songwriter Jadea Kelly that brings them to St. James Hall in Vancouver Nov. 10, with two more B.C. dates following (Duncan Nov. 11, Victoria Nov. 12). The tour is in part to promote the vinyl release of the album. Jess Rae Ayre, Amber Rose and Michelle Anderson formed Sweet Alibi in 2009. Ayre and Rose handle lead vocals, Anderson plays guitar and other instruments and sings harmony. Mitch Dorge (Crash Test Dummies) produced their self-titled 2011 debut. For 2013’s We’ve Got To, Rusty Matyas (Imaginary Cities) stepped in to help. 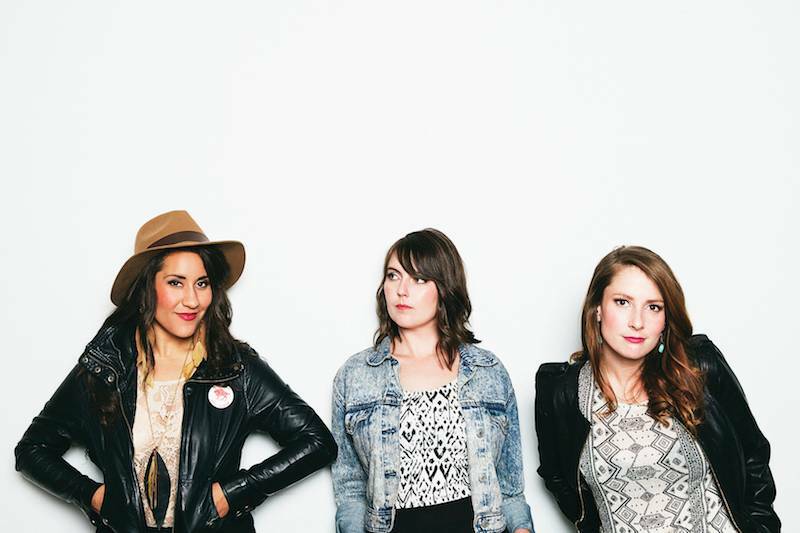 We chatted with Rose while the singer was en route to Calgary, in the van with the other members of Sweet Alibi and Kelly. Shawn Conner: Do you get a lot of cowboys when you play Calgary? Amber Rose: Yes. We did play during the Stampede once at the Palomino Club. We played six sets. SC: Six sets! Did you have to repeat any songs? AR: No, we managed to stretch it out somehow. SC: Do you guys have a lot of backup songs you can pull out, like covers? AR: Yeah, we do. It’s definitely grown over the years. But between the three CDs and the covers we know we have quite a big song selection. SC: I saw a Winnipeg band last night, Duotang. What do you know about those guys? AR: Actually, I believe one of my friends was dating one of the guys. But then she moved to B.C. so I don’t think she’s dating him now. And I think I saw them play once. SC: In the video for “Middle Ground”, the three of you are all walking dogs. Do you all have dogs? AR: Jessica, who’s the lead singer there, has her little dog Vicky, the white one. And the other one we borrowed. They’re actually Jessica’s mom’s dog, the big greyhound. And the other little dog Coco was [inaudible]. SC: Does that mean you and Michelle are cat people? AR: No. Michelle doesn’t have any pets. I think she’s a dog person. And I have two birds. SC: You guys have been touring this record for the better part of a year now. What’s changed in the songs, and do you have any new songs? AR: Yeah. The songs have developed really well. When you release a CD it’s really hard to make those songs onstage. But the more we play them the better we sound them, and the audiences is reacting really well. And we’ve added a couple of new cover songs. We do a Khari McClelland song. We’re working on some new stuff too. Nothing that we’re playing. AR: He sang with the Sojourners. He’s doing his own solo thing right now. SC: What’s the name of the song you do? AR: “Agitate”(note: It’s actually “Song of the Agitator”). SC: Why did you pick that one? AR: We just really like it, and it’s got a really good message, about making sure everyone feels at home where they are. SC: What can we expect from Sweet Alibi live? AR: We’re pretty funny. Some of our songs can be pretty serious. We write a lot about addiction and death, life changes. We also try to keep it really upbeat. By the end of the show. I think a lot of people walk away feeling a little bit energized. And they get to know us a little better, they get to know the stories behind the songs. 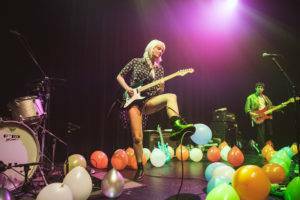 This entry was posted in Features, interviews and tagged folk-pop, Vancouver concert previews, Winnipeg bands. Bookmark the permalink.